humble, sincere regrets. I'll have a full written apology on your desk in the morning. I watched this one on the recommendation of James Berardinelli (who runs the excellent website Reelviews). Just to clarify, I didn't receive a personal recommendation from Mr Berardinelli, but it did come highly recommended on his website, getting a glowing review and a place on his favourite 100 movies of all time. Anyway, for me, the film was a bit of a disappointment, possibly because I went in with such high expectations. 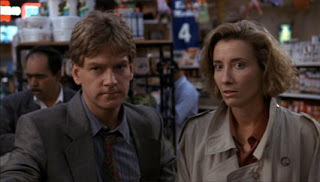 The film is directed by and stars Kenneth Branagh, who plays 1990s private eye Mike Church, who attempts to find out the true identity of a fetching amnesiac, who he has named Grace (played by Emma Thompson, who was married to Branagh at the time.) He is assisted into his investigation into her past by a mysterious psychic and antique dealer (Derek Jacobi), who reveals that Mike and Grace knew one another in a previous life - back in the 1940s, they were a famous composer and musician who were married to one another - a marriage which ended in murder... I'm not entirely sure why this film didn't work for me - I suppose for a start, I find the whole idea of past lives to be a bit far fetched. I also found Branagh a little hard to buy as a private eye, and a number of the performances (particularly Jacobi) were rather campy and other the top. It generally engaged my interest for a couple of hours, but I would rather have been watching a genuine classic film noir, such as Double Indemnity or The Big Sleep. 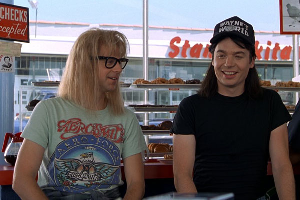 I've seen Wayne's World far too many times for me to give any kind of unbiased review - I think I first saw it when I was around 12 or 13; I thought it was hilarious then, and my opinion of it hasn't changed since. (Perhaps this is an alarming indictment of my retarded mental state - who knows?) I know quite a few sections of the film by heart, and was shouting the lines out at the screen, which I'm sure delighted the two people with whom I was watching the movie. My favourite moment? Probably when Garth is trying to attack the donut man he's built at Stan Mikita's coffee shop: "Hey Mr Donut-head man, who's tryin' to kill ya? "I dunno, but they better not. Aaaahhh, that's not good...." Apparently Mike Myers isn't a very nice guy in real life, and he's made a few stinkers over the years, but for making Wayne's World, he'll always be OK with me. I'm sure he'll appreciate that sentiment as he counts his millions of dollars. Clint Eastwood's excellent modern Western raises the question of whether a man is ever really able to change his ways. Eastwood stars as William Munny, formerly one of the meanest, drunkest villains of the Old West, but now attempting to live a new, sober life on a farm, as the widowed father of two young children. Into his path comes temptation, in the form of a young outlaw calling himself "The Schofield Kid", who is seeking a partner to collect a $1000 bounty put up for the man who kills a cowboy guilty of horribly disfiguring a prostitute. Although Munny is at first reluctant to go on this mission, the parlous state of his finances make him change his mind; he brings along his former partner Ned Logan (Morgan Freeman) along for the ride. Standing in their way is a loquacious but vicious sheriff played by Gene Hackman, who has already handed down a (desultory) sentence to the cowboy who attacked the prostitute, and is damned if any man is going to exact vigilante justice in his town. I'm not usually a huge fan of Westerns, but this movie is one of the exceptions to the rule. It features brilliant performances from Hackman, Eastwood and Freeman, a witty script which looks behind the legends of the West to the way things really were, and a fantastic, bloodsoaked finale, in which William Munny realises his true nature. This film caused a bit of an uproar when it won Best Foreign Film at the Oscars last year, ahead of some very strong candidates including A Prophet and The White Ribbon. However, it's a very good film in its own right, and it definitely holds its own in the company of the two movies mentioned above. (For my money, A Prophet is the better movie, but there isn't much in it). TSITE opens in present day Argentina, with world weary prosecutor Benjamin Esposito writing a novel based on a difficult murder case he was involved with in the 1970s, when dealing with the governing military Junta added a further layer of complication to his investigations. As we flash back to the '70s, we meet Benjamin's co-workers in the Buenos Aires courts - his young boss, the sharp witted Irene Menendez Hastings (who Benjamin clearly has a thing for), and his assistant, Pablo Sandoval, who is loyal but prone to going on drunken benders. As Benjamin gets deeper into the case, he must constantly deal with a corrupt and defective system. As well as offering a fascinating storyline, TSITE is very well directed and includes a wonderful sequence when Benjamin and Pablo search for a suspect in a crowded football stadium. The film keeps you guessing until the very end, with a surprising and chilling double twist ending, but also features some very touching scenes involving the unspoken love between Benjamin and Irene. As good as watching Racing Club beat Independiente 5-0 in a classico.